The Interdisciplinary Centre for Advanced Materials Simulation (ICAMS) is a research centre at the Ruhr-Universität Bochum, Germany. ICAMS focuses on the development and application of a new generation of simulation tools for multi-scale materials modelling with the aim of reducing development cost and time for new materials. 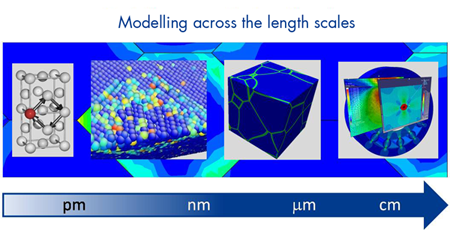 Within the approach taken by ICAMS, the different length scales that are relevant for materials – from the atomic structure to macroscopic properties of materials – are bridged by an interdisciplinary team of scientists from engineering, materials science, chemistry, physics and mathematics. ICAMS is linked to the Institute of Materials (RUB), the Department of Ferrous Metallurgy (RWTH Aachen), the Institute of Materials Physics (Münster University), and the Max-Planck-Institute for Iron Research (Düsseldorf).